Raymond Edward Smith was the first person reported "killed in action" from Columbus, Ohio as a result of the Japanese attack on Pearl Harbor. It was later reported a mistake. He was later assigned to the "USS Mahan," which was hit by kamikaze planes, but was destroyed by American forces so the Japanese could not salvage. 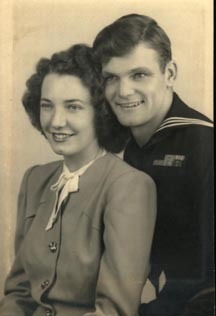 My dad, Raymond E. Smith, was a Fire Controlman First Class, on the USS West Virginia the day of the Attack. He was reported killed in action, but my grandparents received word on Christmas Eve in his hometown of Columbus, Ohio that a mistake had been made....he was alive. He was transferred to the USS Mahan, which was attacked by kamikazes on December 7, 1944. I was never able to get him to speak about his experiences of the day of the Pearl Harbor raid, even many years later. He passed away in August of 1998, of the complications of Lou Gehrig's disease. If anyone remembers my dad, I would love to hear from you, especially about what happened to him that day. Please e-mail me at aabf@wcoil.com.